Renovo are experts in protection and recolouring of vehicle fabrics. This is part of a wider range of new products which have been carefully tested. Cleaning and reviving the colour of black carpets and waterproofing them can do a lot to improve the overall look of the interior of a car. Discoloured, matted down, dirty carpets will make a vehicle look old. 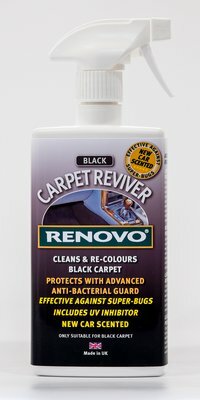 Whilst there is not much you can do for worn out carpets, you can make dirty, faded, black carpets look almost as good as new. against super-bugs and contains a UV inhibitor. It infuses your car with a new car fragrance too!